The granting of tax incentives is one of the methods used to develop a particular economic activity. If designed and implemented properly, it attracts businesses (local or foreign) to invest in a country. Apart from that, it should also lead to increased employment, knowledge transfer, technology development and development to rural areas. Thus, this should lead to increased economic growth and tax revenue (after the expiration of the tax incentive period). Companies in the manufacturing, agricultural, hotel, and tourism sectors, or any other industrial or commercial sector that participate in a promoted activity or produce a promoted product may be eligible for the pioneer status incentive. It involves the granting of a partial exemption (of up to 70% of a company’s statutory income), or in limited cases, full exemption from income tax for a period of five years or 10 years. 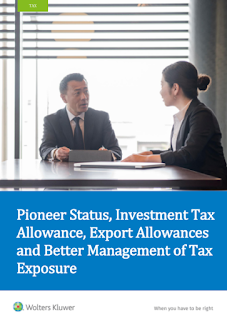 Companies in the manufacturing, agricultural, hotel, and tourism sectors, or any other industrial or commercial sector that participate in a promoted activity or produce a promoted product may be eligible for investment tax allowance. It involves the granting of an allowance of 60% or 100% of qualifying capital expenditure incurred which can be deducted against 70% or 100% of statutory income. A resident company in operation for not less than 36 months that incurs capital expenditure to expand, modernise, automate, or diversify its existing manufacturing business or approved agricultural project may be eligible for reinvestment allowance. It involves the granting of an allowance of 60% of qualifying capital expenditure incurred which can be deducted against 70% of statutory income. The abovementioned investments serves to strengthen Malaysia’s key economic activities and encourage inflow of foreign capital. However, there were no targeted incentives provided for labour-based companies, especially, the manufacturing sector) to embrace digital transformation. Only the reinvestment allowance provides some incentive for companies to be more technologically-inclined. With digitalisation transforming the business landscapes, creating both new opportunities and challenges, it was important for the manufacturing sector to transform, considering that it contributed 23% to Malaysia’s GDP (Q3 2018). In October 2018, the Government launched the National Policy on Industry 4.0 (Industry4WRD Policy) to encourage the manufacturing sector and its related service sectors to embrace digital transformation to increase its productivity and competitiveness as well as become more technologically advanced and open to be able to compete globally. Double deduction on scholarships to Malaysian students pursuing studies at technical and vocational levels, diplomas and degrees in engineering and technology fields. Double deduction on expenditure incurred by a company to upgrade and develop its employees' technical skills in I4.0 technology using approved training programmes. Tax deduction on equipment and machinery contributed by companies to approved Skills Development Centres, Polytechnics or Vocational Colleges. The abovementioned incentives should encourage companies to perform a more holistic transformation, which includes not only process but also its people with regards to I4.0, which is in line with the current business trend of digitalisation. As business landscapes evolve, so do government policies, which will have an impact on the tax incentives that are put out. Steps are being taken to make incentives/policies current and relevant, and the proposal of tax incentives for Industry 4WRD is one of them. Other changes include proposal of increased tax incentives for green technology and legislative amendments to existing incentives to comply with the requirements of BEPS Action 5 where it is now specified that tax relief is no longer eligible in respect of royalty and intellectual property income, and the requirement to have substantial activities in the location where the income enjoying the tax relief is earned. Wolters Kluwer’s Pioneer Status, Investment Tax Allowance, Export Allowances and Better Management of Tax Exposure workshop aims to provide attendees with the knowledge regarding tax opportunities that enable companies reduce their tax exposure through additional deductions or exemptions including avenues that do not require further capital commitment. This advanced-level seminar will provide guidance on the eligibility, conditions, application and utilisation of tax incentives using supporting case studies and computations.